Having an asthma attack is no joke at all – and a serious one could very well lead to unwanted complications. Having said that, how about making sure that you have a device which is able to help you monitor asthma symptoms regardless of where you go? The $29.95 Lung Performance Monitor happens to be a peak flow meter that is tiny enough in its form factor to allow someone to tote it around in a pocket or purse, where it will live up to its namesake in order to assess lung performance regardless of where one is. 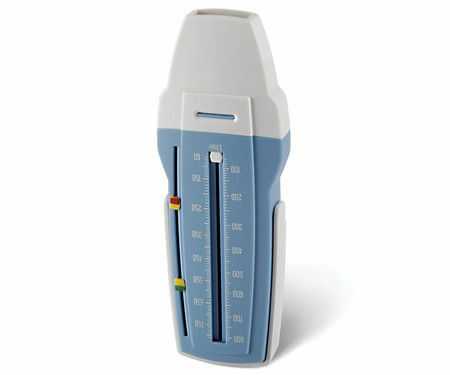 Both adults and children will be able to use this, where all that one needs to do is to blow right into the portable meter in order to measure their peak expiratory flow rate of between 60 and 810 L/minute. Courtesy of its aerodynamic design and ultra-lightweight piston, the meter’s results are deemed to be accurate to ±4%, which happens to be an improvement on the ±10% achieved by other devices in the market. Apart from that, the meter would also enable users to set their target PEF range via adjustable dials, which will be colored using similar red, yellow, and green that are seen in action in doctors’ asthma action plans when it comes to result interpretation. There will also be a smartphone app that helps track readings over time, allowing one to detect lung changes prior to having more serious symptoms occur.